The Enzyme Linked ImmunoSorbant Assay (ELISA) is the gold standard immunoassay for clinical diagnosis of disease. The basis of any immunoassay is the specific molecular recognition between antibody and antigen. This is something that the immune system does naturally. The production of monoclonal antibodies in a laboratory has become commonplace and standardized, which makes it possible to use monoclonal antibodies in immunoassays such as an IgG ELISA. The antibodies are easy to purchase from commercial vendors, and they come with quality control reports ensuring that they will recognize the target antigen. The concept of an antigen and antibody pair is central to modern medicine and biotechnology. These proteins match like a lock and key, with equisite specificity. The interactions are non-covalent, but have equilibrium constants ranging from 105 to 1012 M-1 Antibodies and antigens are proteins: polypeptide chains of amino acids. The IgG antibody is composed of four polypeptide chains, two heavy and two light, organized into a ‘Y’ shape. The base of the Y is called the Fc region, while the two tips are known as the Fab region. The Fab region has antigen recognition sites that are thought of as variable sites. When the immune system encounters an invading pathogen, it reads the identifying antigen of that pathogen and modifies the variable site of an antibody sequence to enable the lock and key recognition between the two. There are five broad classes of antibodies: IgG, IgA, IgD, IgE, and IgM. 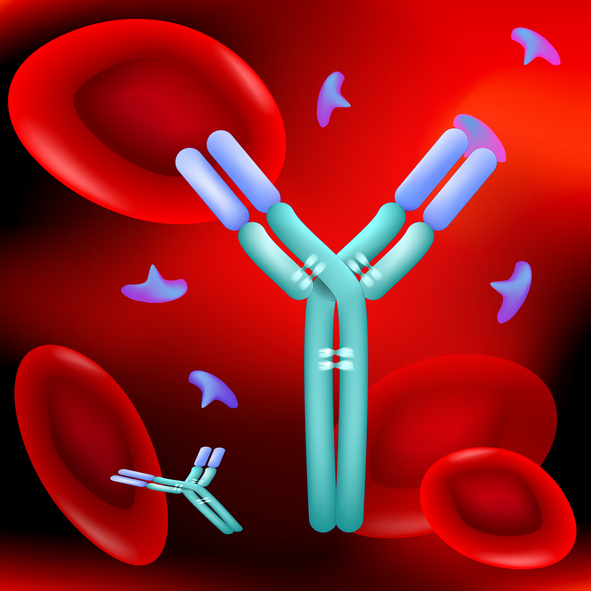 Each class is defined by the type of heavy chain comprising the antibody. Additionally, there are higher-level organizational differences, especially with IgM, which is a pentamer of Y-shaped groups of heavy and light chains. So, while an IgG has two antigen recognition sites, an IgM antibody has a total of 10 antigen recognition sites. The IgG ELISA is built using only IgG antibodies. All ELISA immunoassays are performed in 96-well polystyrene plates with a special biochemical coating enabling protein adhesion on the bottom of each well. The bottom layer of the ELISA contruction is either a protein (for direct or indirect ELISA), or an antibody (for sandwich ELISA). The scaffold is dictated by the goal of the assay. If the assay is being used to detect antibodies in serum, then the antigen will be applied to the bottom of the plate. If the assay is being used to detect antigen in serum, then a sandwich ELISA will be used. From here there is a series of blocking and incubation steps to improve the sensitivity of the assay. These steps are optimized through ELISA troubleshooting techniques. An ELISA is a labeled immunoassay. This means that some type of chromogenic or fluroescent probe is required for detection of target antigen or antibody. In a sandwich ELISA, the first layer is an IgG antibody (capture antibody), the second layer is the target antigen, then another layer of antibody (detection antibody) is applied. The detection antibody is conjugated to a detection probe. The detection probe might be a fluorophore or an colorimetric enzyme. A fluorescent IgG ELISA uses light to detect antigen bound to the capture probe, while a colorimetric assay uses a substrate that produces a chemical dye when cleaved by the enzyme conjugated to the detection antibody. The amount of fluorescence or colored dye are quantified and compared to a standard curve to determine the concentration of target in the sample.